In the last several years, Utah has promoted visitation to the FIVE National Parks that reside with in the bounds of the state. The campaign is known as “The Mighty Five”®. 2016 brings the “Road To Mighty“, a new focus on Utah’s magnificent and majestic landscapes with a variety of pre-planned “road trips”. Included are those that are near The Mighty 5®, “along the way”, or of additional interest. Visit some of Utahs 49 State Parks, various national monuments, Scenic Byways, and forests. The Road To Mighty is a collection of itineraries designed to expand a visitor’s experience in the vast reaches of Southern Utah. Select from “Iconic classics”, “Family Frontier” adventures, Dino and Goblins encounters, Native Spirit and Hidden Secrets adventures, river rafting and mountain biking famous Moab trails. Searching for solitude? There are even trips that allow a visitor to “escape” it all. In addition, seven “must-do” road trips have been assembled that take a visitor along some of Utah most scenic byways, to little known State Parks, and to lesser known landscapes. All along the way, a visitor will find a member Inn of the Bed and Breakfast Inns of Utah (BBIU). Innkeepers always seem willing to share their own favorite secret spaces and places. Zion National Park in southwestern Utah has “opened for the season”. From March 24, 2013 through November 3, 2013 access to the Zion Canyon Scenic Drive will be by shuttle bus only. The Zion Shuttle is now running with stops at most of the favorite visitor spots. Leaving from the visitor center, just inside the gates of the Park, the shuttle’s first stop is the Zion Human History Museum. Then it is on to the Canyon Junction, The Zion Lodge, The Grotto, Weeping Rock, and the Temple of Sinawava – the gateway to The Narrows. At every stop, there are opportunities for Ranger-led programs, hikes, and specular views. Visitors may get on and off as often as they like, and the shuttle is free. Check the shuttle schedule, and the Zion map and guide for details. When visiting Zion National Park, one of “Utah’s Mighty 5“, choose from several b & b’s that are members of the Bed and Breakfast Inns of Utah. Just outside of the Park’s West gates in Springdale are the Under the Eaves Inn at Zion National Park, The Harvest House Bed and Breakfast, Zion Canyon Bed and Breakfast, The Novel House at Zion, the Canyon Vista Lodge, and the Red Rock Inn. Just a few miles to the west is the quaint town of Rockville, and the BunkHouse at Zion and Desert Thistle Bed and Breakfast inns. Visit like a local…Ask the innkeeper at any of these inns for their favorite spots within the park. Though Spring is typically the best time to see wildflowers, Utah’s display can be summer-long. Often the best viewing is in mountain meadows and along rural highway fence lines. OR, as many Utah bed and breakfast inns have discovered, wildflower gardens are often a solution to having beautiful gardens in Utah’s arid climate. Albion Basin at the Alta Ski Resort, at the top of Little Cottonwood Canyon, is just east of Salt Lake City. Late July is really the best viewing time. Along the Mirror Lake Highway #150 east of Kamas. If you are lucky, you may see a moose. 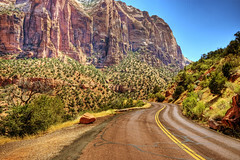 Along the roads and pathways in and around the FIVE National Parks located in Southern Utah. Whether surrounded by lush garden greenery or among rocks in the high mountain desert, utah’s wildflowers are not to be missed. When visiting a Bed and Breakfast Inns of Utah (BBIU) member inn, ask the innkeeper for information on their favorite wildflower viewing spot.